A sandwich is a dish or foodstuff where two or more slices of bread serve as the wrapper or container of some other food. A sandwich consist of vegetables, egg, sliced cheese or meat, placed between slices of bread. In making the egg and tomato sandwich, You can slice your own bread or ask to have it sliced on the thicker side. Preheat oven and arrange bread on a baking sheet. Heat each side for 1 minute or until toasted. Place olives, bell peppers, vinegar, 1/8 teaspoon salt, and crushed red pepper in a food processor and process about 30 seconds. Spread hummus over bread slices evenly ; top with lettuce, tomato, remaining teaspoon salt, and black pepper. 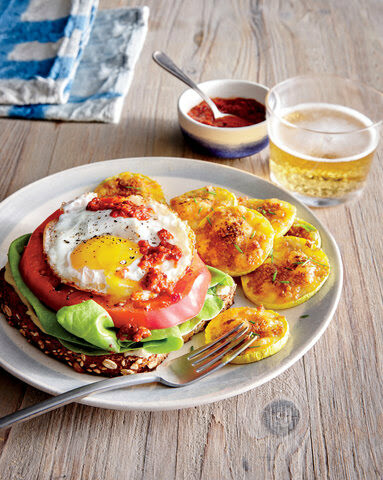 Place on each sandwich an egg, spread red pepper mixture evenly over eggs. Sprinkle with the remaining black pepper. How Can I Prepare Sandwich?